We love decorating our kids’ room so that it appears to be a haven of bright colors radiated by an array of varying toys. 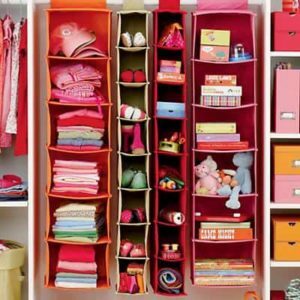 But all of those colorful objects need to be kept in stylish and practical storage containers to make them appear more organized and thus more aesthetically pleasing. 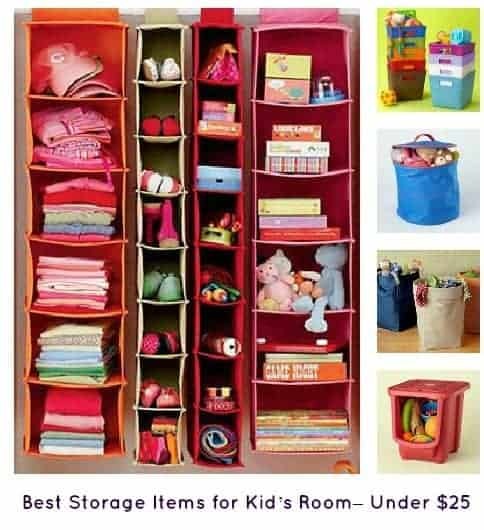 Find out what storage items for kids’ stuff are in the market these days for less than $25. 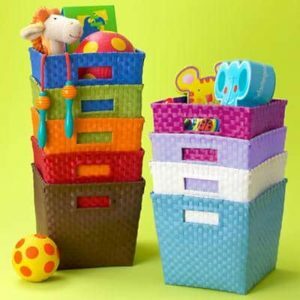 From the nursery to your grown child’s dorm room, all of these solutions will keep their treasures stylishly tidy. We introduce here 5 of the top storage options that can help your kids’ room to appear really tidy. And not only that, they can help you categorize the items so that it is easier for you to clean up and easier for your little one to locate. 1. 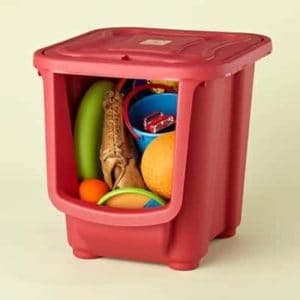 The Strapping Cube Bin is perhaps one of the best picks for storage items for kids’ rooms. For under $11, you get a 100% hand-woven storage bin that is soft and comes in a variety of attractive colors such as hot pink, blue, lavender, red, orange, white, yellow and so many more. 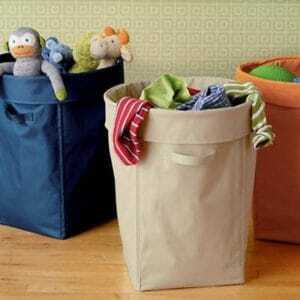 These bins offer an added advantage of having soft corners, so they are completely safe. You can collect these periodically to give a tidy yet colourful touch to your kids’ room. 2. If you want a sturdier option than that, then go for the Pack It In Bin made from co-polymer plastic. It is very durable, has a removable lid and can even be anchored on the wall easily if you don’t want it lying around on the floor. It comes in a bright red colour and costs only $21.95. The good thing about it is that it has a section cut out on one side which lets you peek what you have inside. 3. Next up, is the “I Think I Canvas Hamper” which is great on the pocket and is very pleasing to look at as well. Each of these hampers cost only $16.95 which is amazing as it has a lot of advantages. It comes in three nice colours and is produced from durable polyester with PVC lamination so you have no worried about it getting spoiled or dirty. 4. 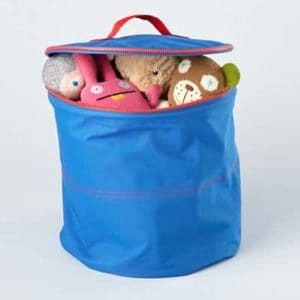 Of course a very easy solution would be the “Blue Grab Bag Storage Bin” which is a cylindrical bin with a zipped lid produced from polyester fabric. It also has a polyethylene interior which makes it easy to clean and costs $7.95 each. When not in use, it can fold flat so that you can keep it hidden anywhere. 5. Last, we have the Hanging Closet Storage from I Think I Canvas which lets you organize the kids’ room beautifully and colorfully. You can hang them from curtain rod and help your kids categorize for $15.95. These are only 5 storage items for kids’ rooms out of the huge array of colourful products that are easily available; which one would you pick first? Note: This post contains affiliate links. However, we only recommend products that we feel will appeal to our readers. Hi there colleagues, its impressive post concerning educationand fully defined, keep it up all the time. These are great ideas! My older son’s room looks like a bomb exploded in it and his shelves are overflowing. I might have to incorporate some of these bins! Love those canvas hampers! Looks like they store a lot! I love the look of the Pack It In Bin. And I love all the bright colors. They would go well in my son’s bedroom! I love these ideas! It’s so hard to keep stuff organized in a kids’ room and these cute options are great! Thanks!